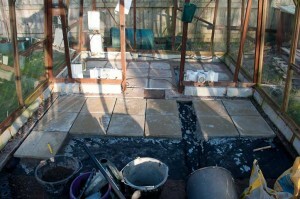 This year to try and make the greenhouse better to work in and hopefully stop some of the slugs getting in, I decided to lay paving slabs down inside the greenhouse as well as give it a good winter clean. Previously I’d simply pulled up the floor matting I had put down and relayed it back down each year. This worked fine but meant if it rained the floor was all slushy under the matting, Not exactly nice to work on. But I’m glad myself and the family did it over winter. It now feels like you are working in a solid structure and is very pleasant. I also sealed all the side parts to the greenhouse so there are few gaps now for any slugs to get in, I’m sure they will manage to but hopefully not as easily. To try and allow some form of drainage but still stop the slugs from getting inside from underneath in the soil, I decided to embed some drainage gullies along side the paving. Rather than let these just drain into the ground though they are fully sealed underneath, but I’ve put small holes within the gullies and bunged them up with some rubber bungs. Now if I need any water to drain into the ground I can just pull up the bungs from the holes and then let it drain out and put them back in afterwards. With hydroponics all the water is within tanks so this should rarely be used. If the worst comes to the worst with the slugs I can always make the gullies into huge slug traps by filling them with beer, The greenhouse could become a little smelly then though. 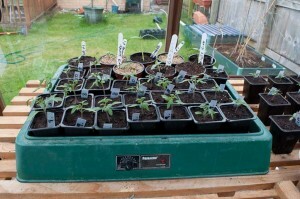 Doing all this work and the miserable weather we have had has meant I’m slightly slower in growing things this year, But have now got some tomatoes and cucumbers well on the way in propagators. Incidentally to save a little extra money, I’ve cut up a plastic sheet I had lying around into little plant labels and have labelled them all with a number. So I just have a table of numbers which mean different plants. That way I can use the same plant labels each year and don’t have to try and fit all the long plant names onto each label. This year I have decided to have another go at growing Strawberries hydroponically, I’ve tried once in the past but never succeeded much. I’m going to try and grow them several different ways to see which ones work. Including an Ebb and Flood setup, An Aeroponic setup, NFT and a bubbler system. I’ll devote a separate post to each one shortly. We have finally settled into our new house, and we have a brand new Alton greenhouse which we have used for the first time this season. 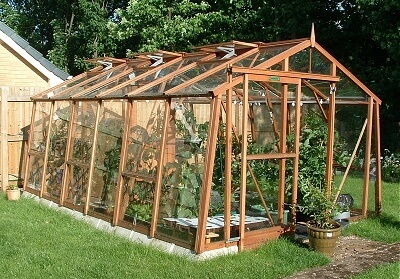 This being so I thought it was about time I told you a little about what we have done with the greenhouse, The greenhouse itself is 18 feet by 10 feet in size and contains a partition two thirds of the way in. This is so that we can attempt to keep the small section at the end heating during winter to hopefully carry on growing some plants. While the rest of the greenhouse is used to over winter our other plants. 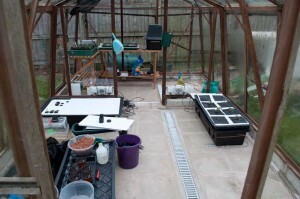 I have currently removed the partition door to allow easy access to all areas of the greenhouse during summer. The greenhouse took 3 of us approximately 1 and a half days to build, It all went suprisingly smoothly. 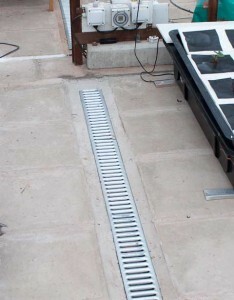 Partly due to the well constructed Alton panels. 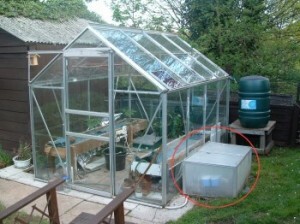 As you can see on the picture the greenhouse has 3 automatic opening vents, These were an extra cost to have but save lots of time as you just set the temperature on the back and they automatically push the vents open and close when necessary without any intervention, They work by having a piston type mechanism with fluid which expands when the temperature increases therefore pushing the vent open. They even close automatically when the wind gets too much. (Not quite sure how they do this). 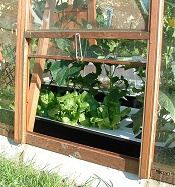 The greenhouse also contains 6 side vents which can be manually opened, Some thought has been put into the design of these as they can be opened from the outside which is great as I don’t need to interfere with the plants to open and shut these. I have even got a system inside the house configured which tells me via speakers whether I need to open any of these vents in the morning. For more details about this check out my automation page. To add to the natural ventilation I have installed two fans, One in each of the partitions. These are run most of the day as long as the temperature is not too low. They also run sometimes during the night to make sure the air still moves during the night to avoid any mold or deseases which can occur on the plants due to stale air. These are controlled via a PC I have setup for automated things around my greenhouse and within our house. 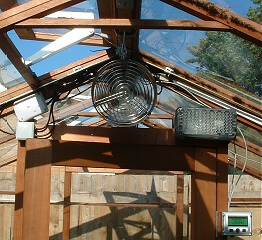 You can also see in the photo the greenhouse lights I have installed. I have also made up electrical outlets in each corner of the greenhouse, These are all weather proof ones which are ideal for the greenhouse environment. At each corner I have a timed connection available and constant power. This allows me to connect any pumps I require to run continuosly or timed for different types of Hydroponic configurations I might want to try.